* First you will need the AmigaOS4.1 Final Edition SDK (available for free) from Hyperion Entertainment. Fully multitasking search bar with start/stop and pause/resume. File pattern filter added to search bar, and maintained separately for each search type. Interact with results as they are found, or continue to use all other parts of the SDK Browser as the search continues in the background. Search will continue even when hidden or iconified, and is controllable from the commodity exchange as well. History Bar. Quickly return to any of the last 20 items that have been viewed previously. Browse forward or back with the arrow buttons, or pull down and select a new position within the browser history. The history bar works like a combination of a web browser forward and back buttons and a rotating 20 item tabbed display. Giving you the flexibility to quickly work with the last 20 items that have been referenced already. Support for more than one interface(API) found within the same library. If the XML file for a given library contains more than one interface for accessing that library, then the SDK Browser will create a new browsable Library tree for each interface and name them with their respective interface name. This is also why the Interface name was added to each library entry under the Library list. Faster than ever before using newly optimized viewing routines and less disk access. Function calls under "Commands" or an open view of any "Library" now displays just the description of the function call within the AutoDoc instead of displaying the entire AutoDoc and attempting to search for the start of the description. This makes for a cleaner an easier to read display, while the entire AutoDoc file is still instantly available by selecting the Library name itself, or browsing the "AutoDocs" directly. Quick find ANY item in the active list just by typing the first few letters of its name. New "Includes" browsing. Live browse the system includes using the new embedded directory scanner. Convenient "Send To" menu for launching a helpful set of external viewers right from the SDK Browser. Quickly open source files into the editor of your choice, or open HTML files directly into your web browser of choice. You can also launch the currently selected file with "MultiView", "AmiPDF", or even "Unarc" those archives. Improved interface handles all Library, Commands, AutoDocs, and Includes browsing under the "SDK" clicktab, while also giving the user a "Project" tab and directory scan lister for browsing their own project source or any where you need to, quickly and easily from one tool. Extensive keyboard controls to enhance the existing "mouse-over" focused movement keys and "mouse-wheel" support. Programmable SDK and search paths. 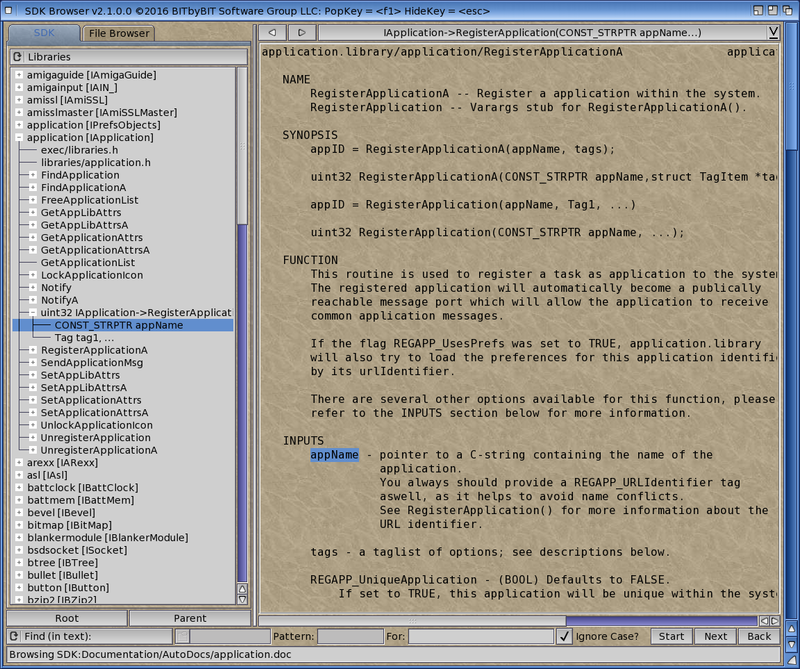 Programmable EDITOR and WEBBROWSER tooltypes for use by the "Send To" menu.